Wow, not a single model with an ambi safety?? Bummer. Merc50, you forgot this one, which I really want, the Skeleton P210. 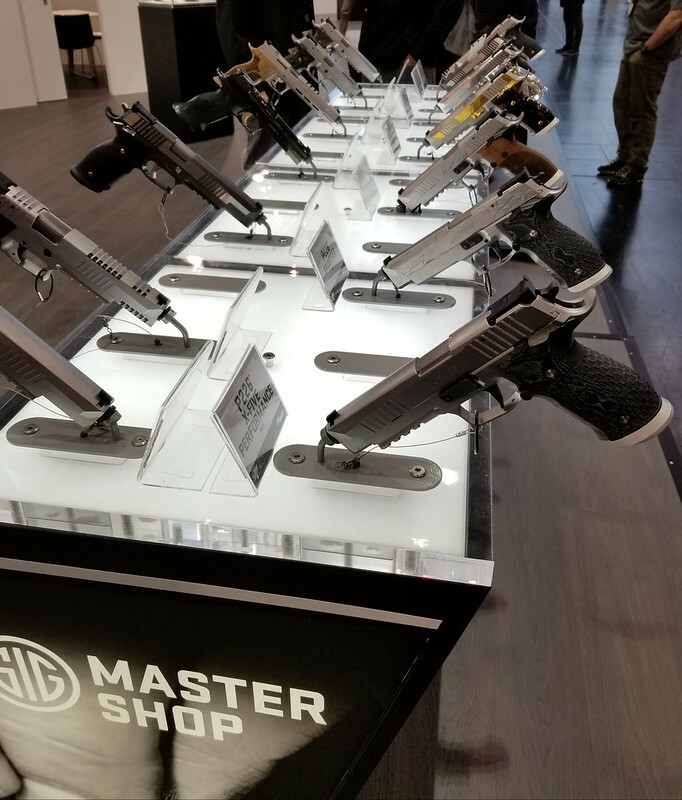 Q - I’m looking forward to the range report! Interesting. I would've thought the Skeleton Black would look a lot better than the Skeleton White, but (IMHO) it's the other way around. OTOH, that Midnight 6" looks amazing. Need one that's has 4" barrel and SAS treatment. and probably night sights. if they can get those out at $8-900, probably be a good seller. 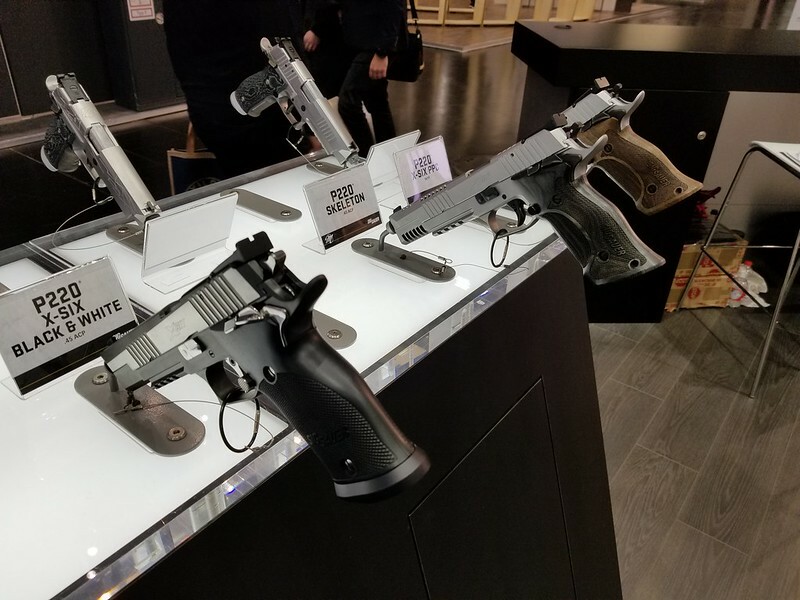 Not to thread drift, but does anyone have a photo or two of the new SIG P226 Performance X-Five exhibited at IWA? 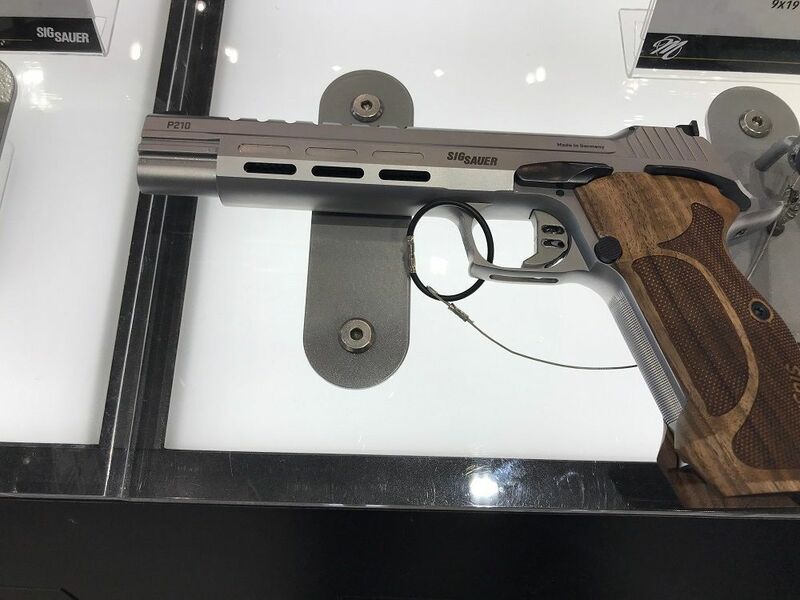 BTW, if SIG introduced the P210 Midnight but chopped an inch off the frame/slide/barrel, put regular grips on it (black finish is fine) and night sights... that would make a killer P210 Carry, which I'd have to buy. Not sure why they name it the Performance, because it sure looks just like the Supermatch, at least externally. I like the Facettes myself. I saw that photo and thought the same thing. The description only mentions the grips are laser cutout... come on, really, that’s the major improvement? Hmmm. With or without the full lower dust cover? I could see it either way, myself. 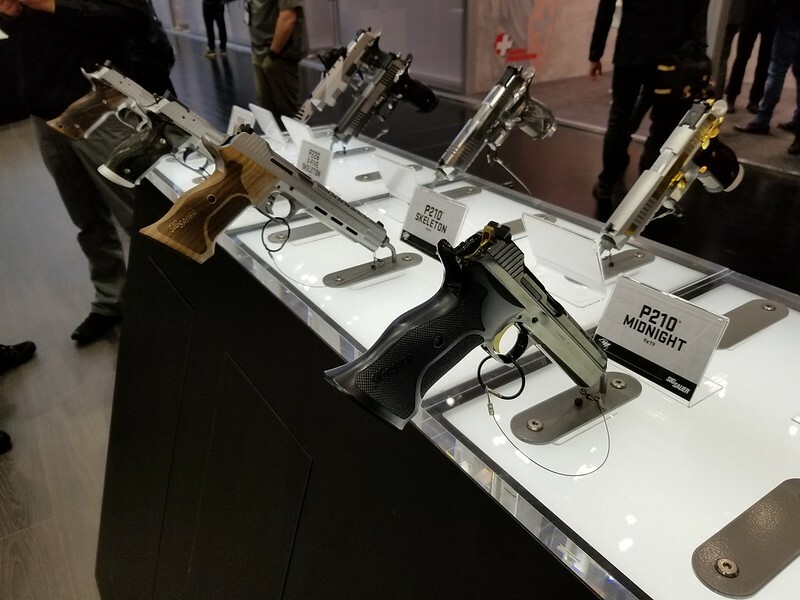 Two pics of the P226 Performance X-Five from IWA, in the second pic its the one at the top, taken from the back-side. Next year I'll plan to take a small camera, vs phone pics. Either would be fine with me. Took SIG a few years to swap sights and put standard grips on the Target model to make the Standard edition, so I’m not holding my breath. Serious target shooting with P210 (Bullseye) - now called Precision competition - uses a quality red-dot sight - not iron sights. Cut down the rear bump and provide means to attach quality red-dot sight (include target grips) and SIG might have something for the Bullseye people. As is this accurate pistol is too large and heavy for many carry roles and serious over kill in action shooting. It could be ideal in Bullseye. Just an opinion. This is blasphemy and I know it, but I wonder if a micro red dot could be mounted ahead of the hump and behind the chamber. That would keep it relatively low and both allow the use of the factory irons and keep the presentation relatively consistent. Obviously it would require a different slide design. A great idea. Something close to this is done on M&P9 Pro CORE (not M2.0) One could use iron sights or red-dot sight. The result of implementing your idea could be a pistol to fit Bullseye and the iron sight events. I expect that some of the hump would need to go. I just bought the 210A Target two days ago, and yes I’m going to put the smaller, grip frame length stocks on it. 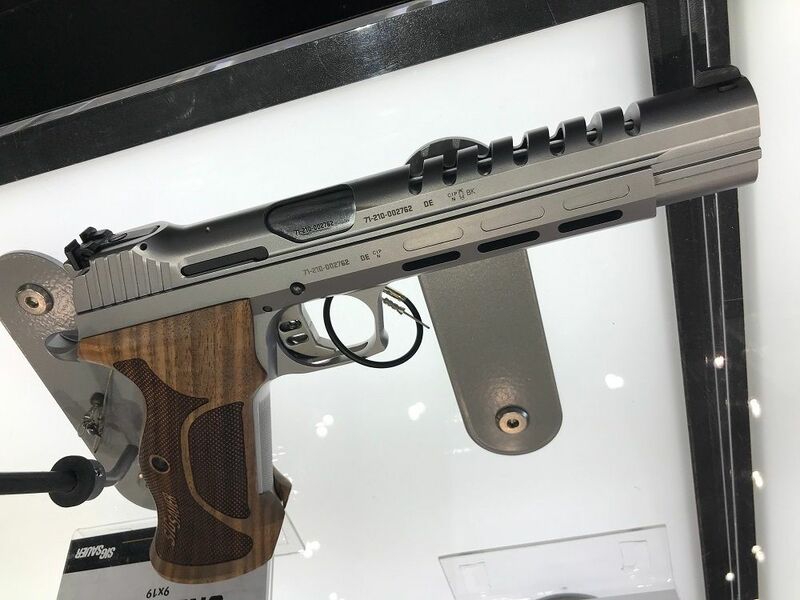 Without having shot it, I so stupid like this thing that the first carry version my dealer gets in WILL go home with me. I hear some talking about the trigger being too light for a carry gun, and I do hope the carry version adds about a pound of trigger weight, but my new Nighthawk T4 has a tad lighter trigger than MY 210A Target. Did I mention I like this gun?! I could stand a different safety lever too. I shoot mostly 1911's lately using a high thumb hold. That type of hold feels good on my 210A, probably feel better when I get the new service grips that I ordered, but the safety on mine is too sharp. Wider and smoother would be good. After how many of the changes people have requested is it no longer recognizable as a P210, I wonder?